Sung to the same tune as “As Zion’s Youth in Latter Days” (Hymn #256), this boisterous anthem proudly proclaims our lineage as Children of a loving Heavenly Father. 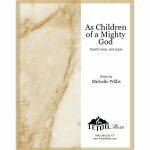 Written in 2-part voices and suitable for adult choirs or youth groups. to prove ourselves for heav’n. weary saints unto eternal life. to claim us once again. our Savior He shall be.